Craig Whittaker and Defence Secretary Phillip Hammond visiting Brunswick Tooling, Brighouse. Calder Valley MP Craig Whittaker has welcomed new figures showing a drop in the number of people claiming Jobseeker’s Allowance. Since 2010, the number of people in the Calder Valley claiming the benefit has fallen by 1,467 - a 61 per cent drop. 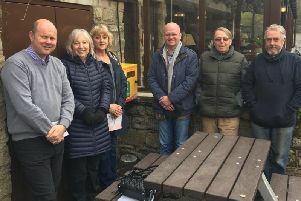 Mr Whittaker said: “It’s great news that over the last five years the number of people relying on Jobseeker’s Allowance here in Calder Valley has fallen by 1467. “That means more families with the security and stability of a regular pay packet – with good jobs being created by businesses across our area. “And in a further boost for families financial security we’ve also seen the highest real wage rises in seven years over the last year. This is down to the hard work and the determination of people here, as well as the Conservative’s strong leadership and clear economic plan.